To avoid shipping damage, please be sure to pack your gear very carefully. For standard 19” rack gear, use a double wall carton that’s at least 23” wide, to allow at least 2 inches of cushioning on each side. It’s very important to protect the area around the rack ears, so that they can’t cut through the carton and expose the unit to damage. See our “How To Ship Rack Gear” page for more info. If your shipping carton is too small or not sturdy enough, we’ll need to use our own carton and packing materials for return shipping, which will increase your total cost. Please don’t ship the AC power cord with your equipment, unless it’s a special type. Generally, we don’t require an RA number or advance payment. Partial or full pre-payment is required for all repairs; the amount will be specified on the estimate that we send you. You’re welcome to email or call (818-843-7981) to give us a heads up or go over costs or other questions before shipping, but it’s not necessary. Many of our web pages show typical prices for servicing. For other gear, you can contact us for a preliminary estimate. Generally, the minimum price for repair of rack gear is $250.00, plus return shipping. Digital gear is usually more expensive. Usually we’ll want to replace all electrolytic capacitors in the power supply. In many cases, to assure reliability, we’ll need to replace all the electrolytics in the unit. We cannot guarantee any repair cost until we receive your equipment and evaluate it. All gear shipped to us for service is subject to a minimum $75 fee, to cover unpacking, initial tests, evaluation, etc. If you decline the repair, this fee, plus return shipping costs, will apply. For complex repair jobs, the cost may be higher. The minimum fee will appear on your estimate. 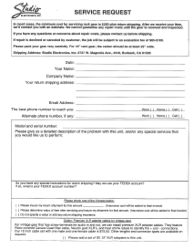 Please print, fill out, and sign a copy of our Service Request form, and include it with your shipment to us. If you’re in the U.S., be sure to let us know the amount of insurance that you want for return shipping. AMS and ADR models are special category jobs with a higher labor rate. For those jobs we require a signed copy of our Service Agreement for that model. Customers in the U.S. usually ship to us by Fedex or UPS. Shipping by post office is fine, but please use a service with a tracking number. Shipments to and from Canada must go through the postal service – not Fedex, UPS, or DHL. If you’re shipping from Europe or Asia, postal service is usually cheapest. For overseas customers, return shipping is by USPS (post office) service only. Due to USPS insurance limitations, we generally cannot insure overseas shipments. Ship your item to Studio Electronics, 3727 W.Magnolia Blvd., #410, Burbank, CA 91505, tel 818-843-7981. We don’t service Lexicon gear, EMT gear, semi-pro and consumer audio equipment, microphones, analog and digital recorders, power amps, hi-fi gear, or video equipment. After we receive your shipment, we’ll send you a Repair Receipt by email. We’ll usually include an estimate but in some cases, we’ll need a few more days to prepare your estimate. If after starting on the unit we find that additional work is required, we’ll contact you with a revised estimate. If a repair is declined or canceled by the customer, the job will be subject to an evaluation fee of $50-$100. Most equipment is repaired within 2-3 weeks of receipt. AMS and certain other pieces require a one week burn-in test after servicing. Tube gear often takes 3 weeks or longer due to lead time in ordering special parts. We’re a small operation, and business travel and vacation plans often affect affect lead time of repairs. Typically, our service department closes several times each year for periods of 1-8 weeks. We usually announce longer closures on our home page to give repair customers a heads up, but for equipment servicing it’s best to contact us and inquire beforehand, especially if lead time is critical for you. Upon completion of the job, we’ll email you a final invoice with the total charges. We accept most forms of payment – credit cards, Paypal, bank transfer, money order, and cashier’s check. Once payment is made, we’ll ship your gear quickly – usually within 2 business days. For North American customers, we usually ship by Fedex ground. We can charge the shipping costs to your bill, or to your Fedex account. If your original carton was damaged in shipping, or we feel it is unsafe, we’ll use our own packing materials, at an additional charge. There will also be a packing/handling charge. If you would like return shipping insurance, please notify us. We pack very carefully, but cannot be responsible for shipping damage after an item leaves our premises. Repair labor and materials are guaranteed for 90 days, beginning on the day that the closing invoice is sent to you. Repair returns are very rare, but if something does go wrong, we’ll get you taken care of as quickly as possible. Many service jobs include time for improving cosmetic issues, replacing damaged, missing, or incorrect hardware, and/or doing “body work” for gear with bent or damaged chassis parts. In general this is not detailed on the initial estimate or final invoice, but as part of the total job we nearly always use touch up paint and do what we can to make your gear look clean and sharp. Besides working better, your gear will usually look better after we service it. Upon completion, we ask that you pay promptly. If gear is left at our shop over 6 weeks due to lack of response to the estimate, non-payment, or failure to perform pick up, a storage charge of $20 per week will be charged. Items left over 6 months will be considered abandoned and will be subject to auction under the California mechanic’s lien law. If gear is left at our shop for 2 months or more due to non-payment or failure to perform pick up, we may need to re-test the gear before shipping or pick up. If we determine that re-testing is needed and perform this additional service, a nominal charge for labor time will be added to the invoice.